German castles are world-class. 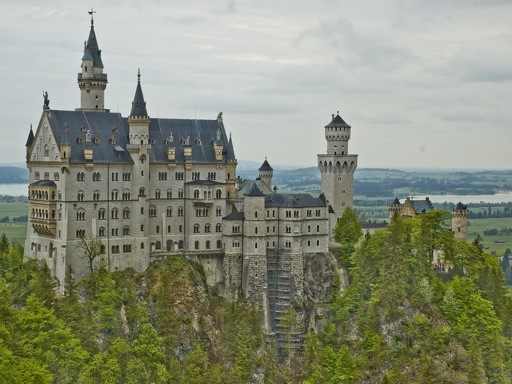 Castles in Germany range from higgedly-piggedly Medieval fairytales through to the grandiose, fantasy palaces of ‘Mad’ King Ludwig of Bavaria. 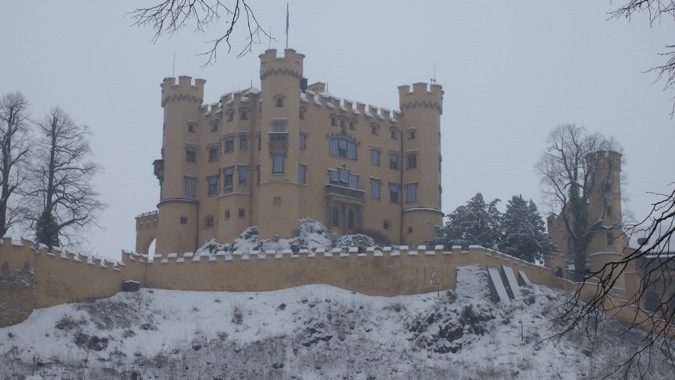 But there’re German castles for everyone – not just for romantics. Military historians will be able to pore over the remnants of vast old fortresses, like Marienburg in Bavaria. And entire towns – such as Heidelberg – are built in the shadow of mighty old castles. As a result, it’s easy to understand that German castles are the jewel in the tourist crown of this green, clean and hospitable country, and leave an imprint on the minds of the millions who visit Germany each year. If you’re looking for a hidden fairytale, Burg Eltz is quite perfect. This spectacular building – possibly the most magical of all German castles – lies in a woodland glen, near to the river Rhine. 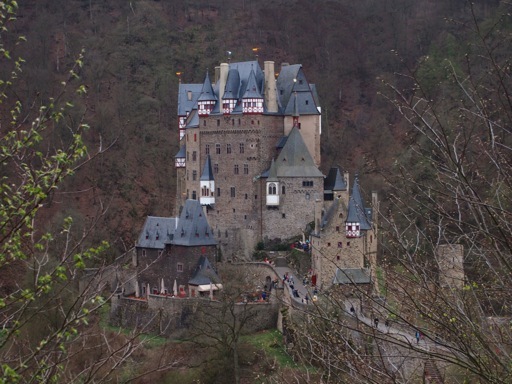 It’s fairy-tale appearance is actually pretty authentic – the castle grew out of three separate fortresses, all on the same spot, and owned by different branches of the Eltz family. Indeed, it’s been held in the same family for 800 years. I visited the castle in 2012, and it’s a stunningly photogenic place. In addition, the innards of the castle are an impressive expose into noble life in Early Modern Germany. I was lucky enough to be able to explore the ruins of magnificent Heidelberg Castle during my last trip to Germany. It’s easy to get swept away by the romance of the site. Weirdly, the castle has been hit twice by lightning, but it was the French, in the late c17th, who reduced this world-class palace into a series of crumbling remains. The picture-perfect ruins of the castle have attracted millions of tourists over the years, including Mark Twain and Victor Hugo. As a result, Heidelberg rightly enjoys international fame – and it’s hard to think of a more beguiling ruin. 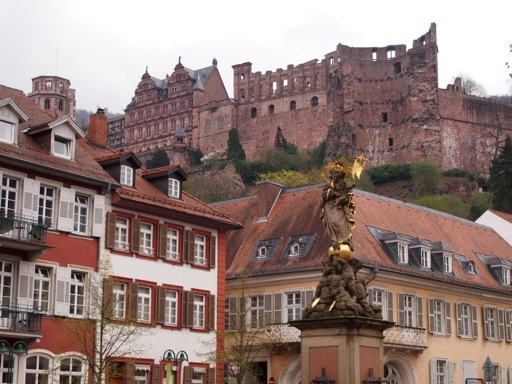 Discover More about Heidelberg Castle. . . Undoubtedly the most famous castle in the world, the iconic Neuschwanstein Castle is a monument to the eccentric personality of one man – ‘Mad’ King Ludwig of Bavaria. Neuschwanstein was built in the late 1800s in the style of a fantasy, Medieval castle. Its exaggerated turrets and postcard-perfect setting have made it internationally famous. Neuschwanstein nowadays attracts more than 1.3m tourists every year, and is said to have been the inspiration behind Cinderella’s Castle in Walt Disney World. Discover more about the inimitable Neuschwanstein. . .
Custard-yellow Hohenschwangau Castle is easy to find – it sits directly across the valley from super-touristy Neuschwanstein. 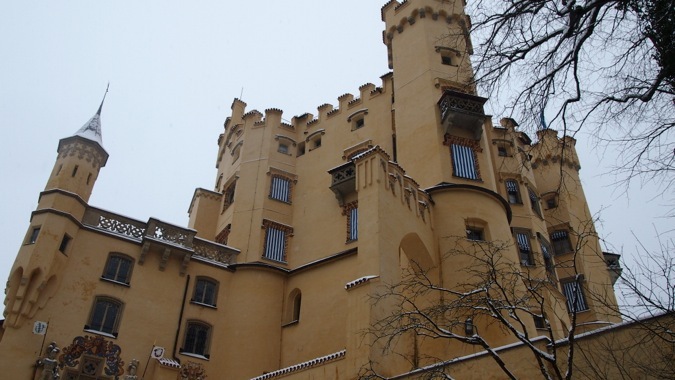 This is the castle where little Prince Ludwig spent his summers. And it undoubtedly cultivated his obsession for Medieval chivarly and fairy-tales – and inspired him to build Neuschwanstein. This diminutive little schloss is a surprisingly homely little palace, fit for a Royal family. It’s also a good deal quieter than Neuschwanstein, only attracting a third of the tourists of its flashier neighbour. 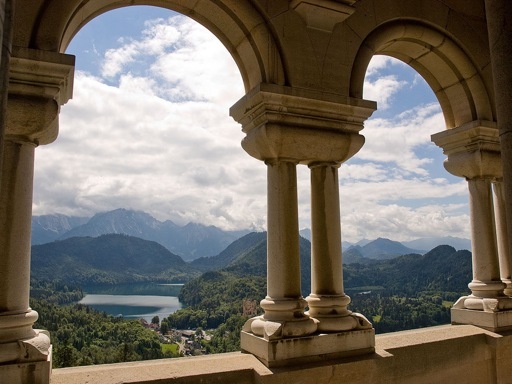 Discover More about Schloss Hohenschwangau. . . The camp, fantasy palaces of King Ludwig certainly aren’t the only castles in Bavaria. Indeed, this place is ‘castle country’, filled with spectacular European castles. Bavaria is Germany’s largest state, and is a proud and independent part of the German union. 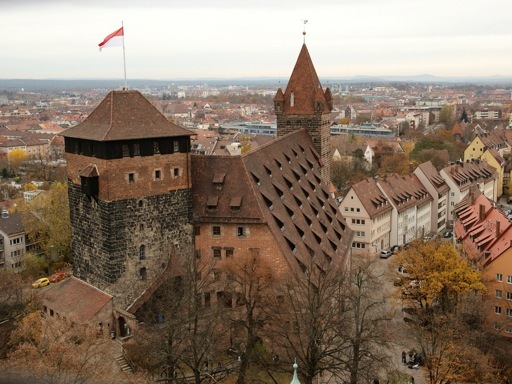 It’s been blessed with some outstanding Medieval architecture, which includes the castle of Nuremberg (pictured). It’s also home to Burghausen Castle, which, at more than a 1km in length, is the longest castle in Europe. 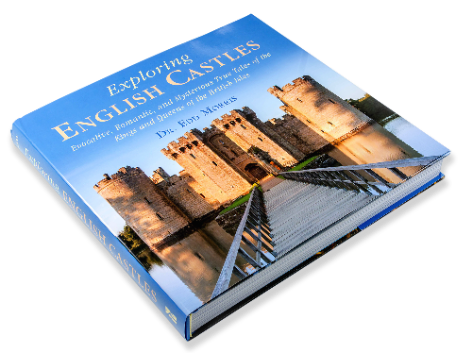 Read more on the Castles of Bavaria. . . Deeply troubled and highly dysfunctional, ‘Mad’ King Ludwig of Bavaria was filled with a pathological desire to build eccentric German castles and lavish palaces. King Ludwig ascended to the throne of Bavaria at a tender age, and, as a result of his inexperience, presided over some dramatic defeats and losses. Stung by his failures at governing in the real-world, Ludwig retreated into fantasy, becoming obsessed with the fairytale stories of Knights, Princesses, and Medieval chivalry. The result of his obsessions – and his increasingly unstable grip upon reality – were the vast fantasy castles of Germany, which famously include Neuschwanstein, and the fantasy palace of Linderhof. Terribly, King Ludwig came to an untimely – and mysterious – death. He was found drowned, alongside his psychiatrist, shortly after the state of Bavaria had officially diagnosed him ‘mad’. Read more upon the tragic life of King Ludwig. 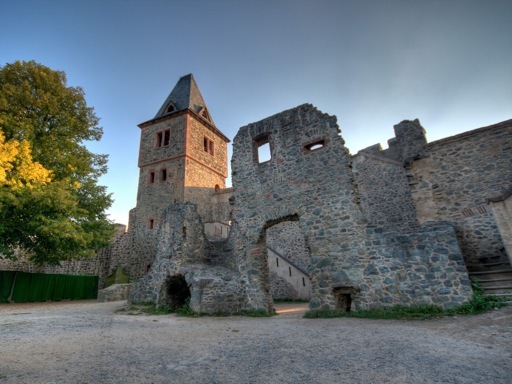 . .
Frankenstein’s Castle sure sounds spooky – and this little ruined fortress, near to Frankfurt, has attracted monster hunters over the years. Mary Shelley, the author of Frankenstein, may well have been inspired by this spot when whilst she travelled through Germany, working on her infamous novel. The castle was once home to John Konrad Dippel – an archetypal mad scientist, born in the castle in 1673. Dippel was obsessed with freaky experiments involving the human soul – and it’s said that he undertook nightmarish experiments on corpses, as part of his scientific endeavours. Many think that Dippel’s crazed experiments in Frankenstein Castle inspired Shelley’s novel. You can be the judge of that! The monstrous stories of Frankenstein Castle. . .
As you probably imagined, public transport in Germany puts the rest of Europe to shame. The Deutsche Bahn train network is extensive and reliable (but maybe not as punctual as you might expect). All this means that it’s easy to see a great deal of Germany’s greatest sights in a relatively short break. A great website for planning a trip to Germany is run by my friend Rita Amend – in particular, check out her advice on travel in Germany. Don’t forget that I’ve also published my own travel guide to Munich, Fussen and world-famous Neuschwanstein Castle if you’re planning on visiting that area.